After her Ph.D. Dr. Jackson was a Research Associate and John Hope Franklin Postdoctoral Fellow in the Mathematics at Duke University. Currently, she and her husband Patrick Nelson are on the faculty of the Mathemtics Department of the University of Michigan. From 1999 to 2000, she held a John Hope Franklin Postdoctoral Fellow at the Center for Mathematics and Computation in the Life Sciences and Medicine, Duke University. Most recently, Dr. Jackson has been awarded the Afred P. Sloan Fellowship, she is the third African American Mathematician to do so. From 2000 to 2003 she was Assistant Professor of Mathematics at U. Michigan, she was promoted to Associate in 2003. We remark that her invited lecture in 2003 at CAARMS9 at Purdue University was first rate. Within the past ten years, rising scientific institutions gradually embraced the growing academic field known as mathematical biology, best described as an application of mathematics to a variety of topics in the biomedical sciences. Significant research has focused on improving the effectiveness of cancer chemotherapy. Known as an irregular division of one?s cells, cancer will produce an excess amount of cells in the body, which could encapsulate into a tumor. 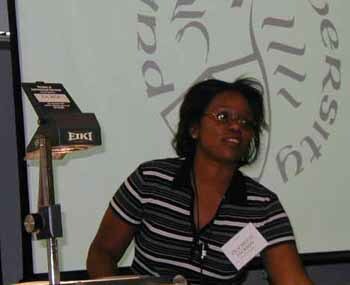 Dr. Trachette L. Jackson, a former John Hope Franklin Postdoctoral Fellow at Duke University, obtained all of her degrees in Applied Mathematics and her research eventually led her to the University of Michigan, where her research interests lie in the biomedical sciences and the growth and control of tumors. Dr. Jackson's research focused on angiogenesis, the actual growth of the tumor, and also concentrated on the ?mitosis clock? of a cell, its duration and behavior during its growth cycle. In her Project Abstract, introducing the Spatio-Temporal Models with Age Structure experiment, she clearly articulates the major concentration in her research. ?Since many traditional chemotherapeutic agents are designed to act on metabolically active or rapidly dividing cells, it is necessary to include cell-cycle specific drug dynamics into the modeling framework? (Jackson 5). After her detailed exploration of the life cycle of cancerous cells, starting from mitosis to angiogenesis, Dr. Jackson acknowledged that the two chemicals, maturation promotion factor (MPF) and cyclin directly affect the reproduction of cancerous cells. Dr. Jackson proceeded to create a model of generic tumor in order analyze and numerically simulates math models to draw generalizations to foster a better effective cancer treatment. By October of 1998, Dr. Jackson had published initial research, exploring several alternate possibilities for cancer treatments. Jackson opens the article: Theoretical analysis of conjugate localization in two-step cancer chemotherapy with a brief yet detaileddescription of how tumor can form in an afflicted person?s body. Once the cells begin to rapidly divide, they can encompass in one area and form a large sphere cells. These cells are avascular, because they are dependent on blood vessels; they must rely on the surrounding tissue because they do not have their own vascular supply. Then the tumor begins to grow and angiogenesis occurs. New blood vessels are created from existing blood vessels. Cells, which could be malignant, detach from the tumor and use the new blood supply to travel throughout the body. The rapid spread of cancerous cells continues to trouble physicians. According to the Theoretical analysis, the tumor model created by Dr. Jackson ?was used to examine various dosing strategies in an attempt to determine which regimen would provide the best biodistribution results? (Jackson 353). Dr. Jackson focused on the chemicals responsible for cell growth by creating a model which alters the concentration levels of both MPF and cyclin in human cells placed in a patri dish. The chemical?s change in concentration did indeed change the cell?s rate of division. Mitosis is the division stage in the cell cycle. Experiments show that MPF and cyclin both have an increase of concentration during mitosis; the cyclin levels were proven to oscillate. When MPF hits the peak concentration level for the cell, the cell divides. Dr. Jackson studied the relationship between these two chemicals. When an increase of cyclin is added before the peak of MPF, the cell will divide quicker, whereas when cyclin is added after the peak of MPF, the cell will divide slower. An interpretation of this data: when there is a large amount of MPF within the cell, a tumor will form much slower, if even at all. Using this new knowledge, medical researchers could now experiment injecting different levels of the cyclin in attempt to slow down and better yet halt the growth of the cancerous cells. Dr. Trachette Jackson has a strong knowledge and passion for biology. Her first year as an undergraduate at Arizona State, Dr. Jackson had wanted to be a doctor. Her senior year, the math department had a contest, and the problem concentrated on the rate of growth of bacteria. As she began to work on the problem, she realized not only how she like math, but was able to apply it to the scientific concept fairly easy. Not only did she win the contest, but had decided to pursue a fairly unknown academic field. Having a strong background in both math and biology allows for Dr. Jackson and others in her field to approach research from various angles. The research of Dr. Jackson is seen nationwide in cancer journals and clinical research. Yes, her models are mathematically based, but they are generally scientifically influenced. The influence of math in biomedical sciences allows for a concrete interpretation of a scientific situation and a realistic approach towards the conclusion. Currently my work centers around moving boundary problems which occur quite naturally in tumor growth and treatment strategies. I am developing a spatio-temporal modeling framework which describes both vascular tumor growth and reduction due to therapy. Previous modeling efforts in this field have either focused on the fraction of cells which survive chemotherapeutic pulses or on the growth patterns of avascular tumors in the presence and absence of inhibitors. The former modeling strategy makes no attempt to account for the spatial patterns of tumor growth and its effect on treatment. Whereas the latter, describes benign tumors with no internal blood supply. My mathematical models are firmly based in vascular tumor biology and includes many of the features of in vivo tumor growth and many of the barriers to blood-borne treatment. I employ both analytical (asymptotic analysis, multiple scales techniques, and perturbation theory) and numerical techniques to gain insight into the model equations and to predict optimal treatment protocols. Most spatial models of tumor growth assume spherical symmetry. I plan to study the effect chemotherapeutic drugs on invasive, non-spherical tumors with irregular boundaries. Treatment strategies which lead to cures and regressions of spherical tumors may fail when asymmetries are present. I expect that successful mathematical and numerical analysis on theses models will lead to improved treatment strategies for invasive carcinomas. Since many traditional chemotherapeutic agents are designed to act on metabolically active or rapidly dividing cells, it is necessary to include cell-cycle specific drug dynamics into the modeling framework. Previous modeling attempts to include the effects of cell-cycle specific drugs have taken a compartment approach by assuming cells move from a resting compartment into a proliferating compartment at some rate. My approach adds biological realism in that it tracks the age of the cells or their stage in the mitotic cycle. The chemotherapeutic agent only acts on cells of a particular age or stage. This adds another dimension to the model and leads to interesting mathematical and numerical questions to be investigated. A less complex, preliminary model which, in lieu of age structure, tracks the intra-cellular chemicals which govern cellular progression through the mitotic cycle is already in progress. Criminale, W. O.; Jackson, T. L.; Joslin, R. D. Theory and computation of hydrodynamic stability. Cambridge Monographs on Mechanics. Cambridge University Press, Cambridge, 2003. xxii+441 pp. Criminale, W. O.; Jackson, T. L.; Nelson, P. W. Limit cycle-strange attractor competition. Stud. Appl. Math. 112 (2004), no. 2, 133--160. Jackson, T. L. A mathematical model of prostate tumor growth and androgen-independent relapse. Mathematical models in cancer (Nashville, TN, 2002). Discrete Contin. Dyn. Syst. Ser. B 4 (2004), no. 1, 187--201. Arciero, J. C.; Jackson, T. L.; Kirschner, D. E. A mathematical model of tumor-immune evasion and siRNA treatment. Mathematical models in cancer (Nashville, TN, 2002). Discrete Contin. Dyn. Syst. Ser. B 4 (2004), no. 1, 39--58. Jackson, T.L. Intracellular Accumulation and Mechanism of Action of Doxorubicin in a Spatio-temporal Tumor Model, J. Theor. Biol., 220 (2003), 201-213. Jackson, T.L., Vascular Tumor Growth and Treatment: Consequences of polyclonality, competition, and dynamic vascular support, J. Math. Biol. 44(3) (2002), 201-226. Lubkin, S.R., Jackson, T.L., Multiphase Mechanics of Capsule Formation in Tumors, J. Biomech. Eng. 124, (2002) 237-243. Jackson, Trachette L.; Byrne, Helen M. A mechanical model of tumor encapsulation and transcapsular spread. John A. Jacquez memorial volume. Math. Biosci. 180 (2002), 307--328. Buckmaster, J.; Hegab, A.; Jackson, T. L. More results on oscillating edge-flames. Phys. Fluids 12 (2000), no. 6, 1592--1600. Jackson, T.L., Byrne H.M., Mathematical Model to Study the Effects of Drug Resistance and Vasculature on the Response of Solid Tumors to Chemotherapy, Math. Biosci. vol. 164 (2000) pp. 17-38. Jackson, T.L., Senter, P.D., Murray, J.D., Development and Validation of a Mathematical Model to Describe Anti-cancer Prodrug Activation by Antibody-Enzyme Conjugates, J. Theor. Med., vol. 2 (2000) pp. 93-111. Lasseigne, D. G.; Joslin, R. D.; Jackson, T. L.; Criminale, W. O. The transient period for boundary layer disturbances. J. Fluid Mech. 381 (1999), 89--119. Jackson, T.L., Lubkin, S.R, Murray, J.D., Theoretical Analysis of Conjugate Localization in Two-Step Cancer Chemotherapy, J. Math. Biol. vol. 39(4) (1999) pp. 353-376. Jackson, T.L., Lubkin, S.R, Siemers, N.0., Kerr, D., Senter, P.D., Murray, J.D., Mathematical and Experimental Analysis of Localization of Anti-Tumor Antibody Enzyme Conjugates, Br. J. Cancer vol. 80(11) (1999) pp. 1747-1753.